Warp Sett Tapes, an innovative idea that came from master weaver PatTaylor, can be stuck on the top and bottom of your weaving frame. Each pack contains 10 tapes all of the same sett. 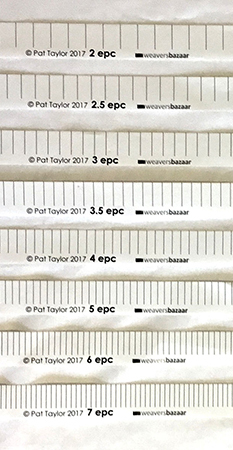 You can choose from 8 warp setts: 2 epc (5 epi), 2.5 epc (6 epi), 3 epc (7.5 epi), 3.5 epc (8.8 epi), 4 epc (10 epi) , 5 epc (12.7 epi), 6 epc (15.2 epi) and 7 epc (17.8 epi). The tapes are 77 cm long and are printed on strong paper. Once in place, you warp up the front warp to a mark on the tapes and then just bring the warp up or down the back of the frame and align the next front warp with the next set of marks.